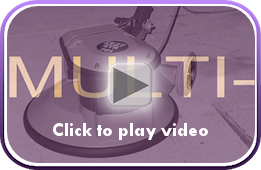 The STR 701™ is a reliable & efficient multi-purpose floor surface preparation machine. With a vast range of specially designed tools, the STR 701 can accommodate a large range of surface preparation tasks. When on site, both economy and convenience demands a multipurpose solution. But this doesn't mean that each action of a multipurpose product should be of lesser quality than a stand-a-lone product! The SPE STR Multipurpose Preparation System system is designed to be both economical and highly efficient at the tasks it is designed for. 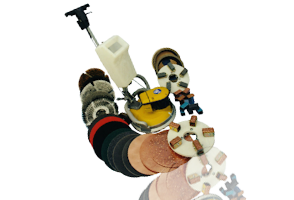 Whether grinding or cleaning, the specially designed cleaning, grinding and brush heads make light work of the many problems faced on site. When connected to one of the SPE 316 Vacuum, dust free operation is available. The STR 701™ is a rotary preparation machine. Simple, safe, comfortable to operate and highly effective. Low noise levels (64dB) along with the complete absence of fumes, vibration and dust make the STR 701™ the ideal machine for refurb and renovation.